An innovative self-tanning bronzer, this unique formula interacts with moisturiser or liquid foundation to instantly add a sunkissed glow while subtly tanning the skin with lasting colour. With odour-minimising technology to remove any tell-tale tan scent, this is the perfect tool to bestow burnished bronze definition. 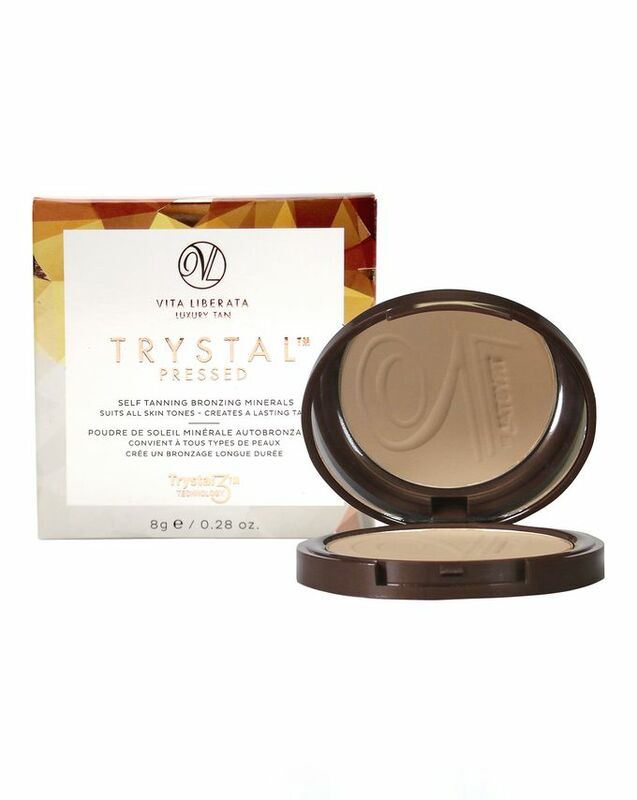 Vita Liberata’s Trystal Minerals Self Tanning Bronzing Minerals offer three bronzing benefits – the coverage of a mineral foundation, the instant illumination of a bronzer and the lasting definition of a self-tanner, all in a pure, ultra-blendable, oil-free formula. The unique, fine mineral formula sweeps on effortlessly and blends seamlessly, interacting with your moisturiser or liquid foundation base layer to grant a sunkissed glow that gradually builds into lasting colour. Free from parabens or harsh chemicals and enhanced with odour-minimising technology to remove that giveaway fake tan scent, the powder can be used around the cheekbones to give a subtly defined contouring effect or over the entire face for a deeper tan result. It is available in two shades – golden brown ‘Sunkissed’ and deeper ‘Bronze’ – to suit your skin tone (or tanning ambitions…). Swirl a brush in the powder and tap on the edge of the pot to evenly distribute the minerals. Applying over moisturiser or liquid foundation, blend the powder onto the face, neck and décolleté in sweeping movements. Use more around the cheekbones to achieve a contouring effect or, for a deeper tan result, apply more product to your face. The subtle tan effect will last 3-7 days, decide whether to reapply based on your face colour after evening cleansing. I use it every single day after my daily cream, leaving a natural matte tan. It is impressive! This is such a great product! It works like a traditional bronzer but truly leaves a natural tan behind. I love this because I don't always want to put tanner in my face. Also I use this to enhance the tan on my legs and décolletage. I have fair skin and I love the colour. It gives your skin a beautiful glow as well. I use this product everyday. Great size to keep in my handbag. It gives me instant colour with the bonus of a lasting glow after a few days use. The ingredients are natural and it feels so light on my skin - as if I was not wearing any make up! Such a hidden gem, this thing is sooo good! Beautiful colour, not orange in the slightest. I love using this as a very natural looking contour. The shade is so perfect and subtle. My favorite way to use this is to take a fluffy eyeshadow brush and use it to contour my nose and hollows of my cheeks. It looks so natural on the skin, that I can get away with just using this, some concealer, and brow products as my no makeup makeup look.